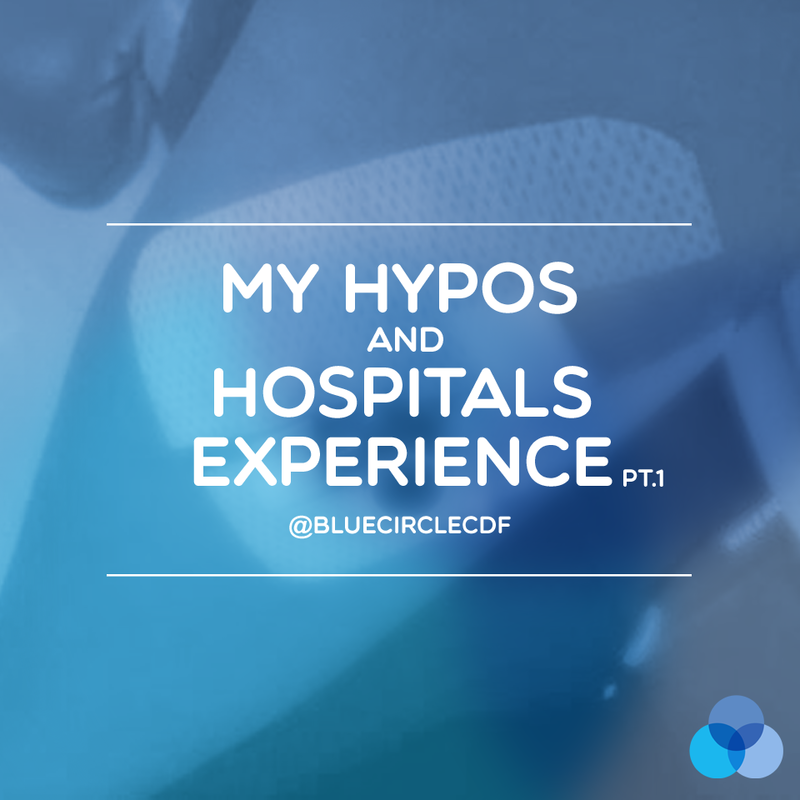 At Blue Circle, we want everyone to share their stories of diabetes, good or bad. I was of two minds as to whether or not to write about my experiences, as I've always wanted the blog to be one of positivity but I also wanted to give honest accounts too. 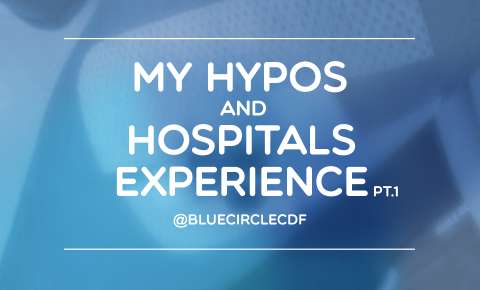 I want to share with you an experience of visiting the hospital in November 2013, and how the events could teach myself and others about Hypos. The day had been a completely normal day, I'd been on a day off at work so had managed to have normal meal times and a good nights sleep without hypos. I'd had breakfast and lunch and then a snack in preparation for training. I remember that I tested my blood sugars at 5pm one hour before training was due to start, and just before I was setting off to get there. I like to test my blood sugars before driving for my own safety as well as others. When I did the blood monitor showed 14.0mmol, a blood sugar a little higher than I would have liked for training so I gave a very small correction dose of insulin of 0.5IU (units of insulin). I drove to training at the indoor athletics track to meet my training group and coach ready to start the session. Unusually for training as our group is made up of both long jumpers and sprinters such as myself, our session that night was the same. The session being 3 runs at 100% effort for 70m followed by other things such as bounding and weightlifting. After warming up the team lined up to do our first run, I was happy with my effort and after I finished I sat on the side of the track with my group to have our recovery of 6 minutes. And before we knew it we were walking down to the start of the 70 metres ready to run again. But it was after doing that sprint that I started to feel the symptoms of a hypo- very unusual for me during training. So straight away I went and tested my blood sugar levels at the side of the track. They showed 7.2mmol the perfect level for training some might say, so I put the shakiness I was experiencing and the racing heart down to the effort excerpted for the run. After having a few sips of energy drink I made my way down to the start of the track for my final 70m run. But after the run was complete I started to feel hypo again and suddenly it felt like all of the strength and energy I had, rushed out of me and I collapsed to the ground. Luckily it was onto the athletics track to I managed to collapse without hitting anything on the way down. On doing this my coach who knows I have diabetes rushed over and one of my training group went and got the designated first aiders at the athletics track. Eventually sitting up slightly I felt incredibly dizzy and couldn't get my thoughts and words to marry up. The first aider helped me do another blood test and once again it showed 7.2mmol. The reading just didn't make any sense because I was experiencing all of the symptoms of a severe hypo. The first aiders were fantastic and wanted to call an ambulance, but because my blood sugar monitor was showing 7.2mmol I didn't want one to come. So when I was able and after taking on board more sugary drink, they wrapped me in the foil you put around runner's when they finish a marathon put me in a wheel chair and wheeled me into the first aid room to wait for my mum to pick me up to get checked over in A and E. It didn't take her long to arrive and so we went to our local A and E department. Even then however, I was later told that I seemed almost drunk in the way I was slurring my words and having trouble communicating. And it took a further hour whilst waiting to be seen at the hospital to start to come back around to normal. Finally I was seen by the nurses who put a shunt in my hand and tested my blood sugars at regular intervals and eventually I saw the doctor. Who unfortunately wasn't able to tell me much as the hypo had been quite some hours ago by which time. But it was still good to have general tests done on my heart and kidneys to make sure everything was functioning as it should, and it was. And as my blood sugars had gone back to normal I was allowed home. The hardest part of that day or evening wasn't the physical side of my body in distress and feeling unwell so much as the psychological effect of collapsing in front of my team mates, competitor's and the rest of the athletics track. And for a long time too it was the not knowing why I had collapsed that bothered me. As far as I knew, my blood sugars were normal but as I've said so many times before. Your the best judge of your own diabetes and only you know how you truly feel, and I knew in my heart of hearts that I'd collapsed from a hypo but it just wasn't showing. So I wondered if it had been something like an adrenalin surge that had caused my blood sugars to fly back up after the hypo. But not knowing for certain really knocked my confidence and meant it was a long road back to training fully again and building back up my confidence along the way. What happened occurred a month ago, but now I finally have the answer to what happened on that horrible day... read on to part 2 for the answer.